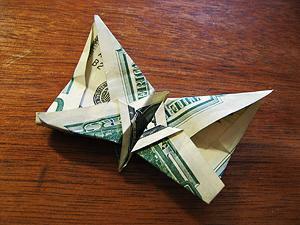 Newcomers to the art of paper folding are always eager to learn how to make a money origami butterfly or other object. Folding money is fun and usually makes a lasting impression on friends and family. Using money for origami is a fresh way to stay interested in the art form. It provides both the modeler and the viewer an innovative perspective on origami. It also feels fun and decadent to use money in such a manner, and if you need to use the money, you can unfold it and spend it anytime you like. People also fold money to use as gift box embellishments, tips for waiters or waitresses, and as party favors for children. Once you've mastered the basic folds involved in origami and moved on to more complicated models, you're probably ready to work with money. The challenges of this kind of origami usually stem from the limited size of the paper, but there are large amounts of resources on the Internet that can help you start folding your first money butterfly. Look at the tutorials and diagrams listed below to find instruction that best suits your skill level. For many paper folding enthusiasts, diagrams are the best way to learn how to create a model. Each step is presented in linear progression and there are a minimum of distractions on the page. The diagrams outlined here are all good choices for learning how to make a money origami butterfly. Fluttering Butterfly: Created by Robert Neal, this diagram yields a final product that is somewhat different from most money origami butterflies. With its fluttering wings and three-dimensional shape, this butterfly makes you look like a master paper folder. Dollar Bill Butterfly: Terry and Kaye Kimpling designed this butterfly to challenge beginners and deliver an elegant, long-winged final product. The diagram is easy to understand thanks to color coding and a variety of line types. Money Butterfly: Michael LaFosse's easy to read butterfly diagram features life-like illustrations and skewed perspectives that enable the modeler to see beyond two dimensions. If you prefer more of a visual style of instruction, videos that display a work of origami in progress might be the perfect choice as a learning. Along with visual cues, videos have the added benefit of providing audio instruction to accompany the pictures displayed on the screen. Consider tackling some of the videos listed below, which are suitable for all levels of folding skill. Lisa Shea's Money Butterfly: One of the most popular origami videos on the web, Lisa provides clear and easy to understand vocal direction as she illustrates each step of the process on the screen. Money Origami Butterfly: This video shows you how to make a money origami butterfly from start to finish. The video doesn't provide vocal instruction, but text detailing each step appears on the screen. Dollar Origami Butterfly: Although this video also lacks vocal instruction, blocks of text appear between steps to guide you through the process. The video is located at the bottom of the screen following textual directions and color photographs of the tutorial. In addition to the instructions featured in this article, you can learn how to fold money origami through books from your local library or book seller. To learn more about the art of paper folding, take a look at the origami articles in the list below.